As titles of talks go, that is something to live up to. I was privileged to speak recently at a big conference and THAT was the title of the talk they asked me to give; no pressure eh? The reality though is that the next presentation YOU give should be the Greatest Presentation in YOUR world. There is no point giving it if you don’t consider that an achievable option. Realistically no one should consider standing up to give a presentation unless it is as good as you possibly can make it. It takes time in preparation and practise and ultimately it is what the audience deserve whether they are a small group for teaching or an international conference at which you are the Keynote speaker.Your presentation should be better than the last one you gave and build on all your insights and experience to deliver what will be The Greatest Presentation in your world. Why ever not? Some presenters feel they are not good enough, that others are more gifted, that they don’t have enough time or that they would just be happy to be mediocre. Why not start off your presentation with that phrase and see how the audience react? Your presentation may not match up to some you have seen but if it is an improvement on your last surely that is an achievable goal? 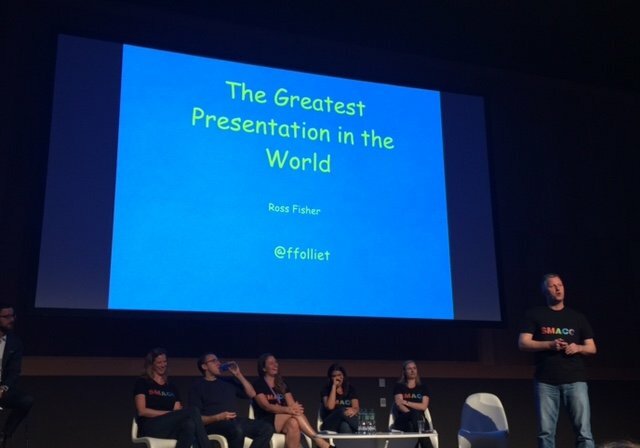 Why not aim for greatness and deliver the Greatest Presentation in Your World. How one achieves such lofty heights is down to the individual but the maths of p cubed would suggest that even small improvements will bring about significant changes. For each of us those improvements are different; better structure of p1, more understanding of the audience needs, something sticky to make the talk memorable, clear sparklines, less text in the slides, better images, fewer slides, more engaging delivery, stepping out from behind the podium, smiling, not apologising, finishing on time, delivering the punchline with passion. Any of those will make a big difference and transform any old presentation into the Greatest Presentation in Your World. Until you give one better. And for clarity, blue background, yellow comic sans and centre justified is NOT The Greatest presentation in the World; it was for comic effect. kindly would like to greet you. I want to be the greatest presentation, but fear and worry is my problem the even single day I did not present anything so why I need your help. These are real issues for EVERY presenter. I think there is value in trying to understand WHAT we are specifically afraid of, quantify that and learn to deal with it. Practise is your main weapon in dealing with it.